Nothing is going to keep Belinda Toussaint from her goal of starting a horse-riding camp for kids who need a fresh start, which means teaming up with the man who's been hired to help turn her vision into reality. But soccer legend Jesse Santiago is as arrogant as he is irresistible. Giving in to the passion igniting between them could head Belinda straight for heartbreak. After a devastating injury ended his pro sports career, Jesse's ready for a major change. The job as head contractor on this innovative project could be the new beginning he craves. It took courage for Belinda to break away from her family's media empire and follow her own ambitions. Now Jesse intends to be true to himself, as well. But when his past threatens to sabotage his future with Belinda, will he be able to convince her that they share the same dream of being together forever? “The kiss…?” Jesse wound the towel in his hand. Worry creased his brow. “And no follow-up. No information on what to do for a repeat performance.” Belinda licked her lips. Even though she teased, she did expect him to play to his bad-boy image. Instead, he was the perfect gentleman. She shook her head. Obviously, their tentative approaches dampened the impulse to go after what they both had felt. Well, she didn’t need a do-over. MICHELLE MONKOU became a world traveler at three years old when she left her birthplace of London, England and moved to Guyana, South America. She then moved to the United States as a young teen. An avid reader, mixed with her cultural experiences, set the tone for a vivid imagination. It wasn't long before the stories in her head became stories on paper. In the middle of writing romantic fiction, she added a Master's of International Business to her Bachelor's in English. Michelle was nominated for the 2003 Emma Award for Favorite New Author for her debut novel -- Open Your Heart. She followed with several notable series, such as, the Glen Knolls about four friends, Mastersons about brothers and sisters, the Ladies of Distinction about five sorority sisters, and most recently, millionaire heroes. Coming in 2014 will be a new series featuring the grandchildren of a formidable matriarch. 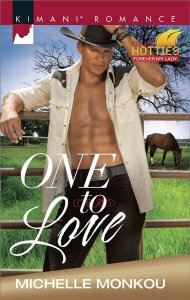 Michelle has been published with BET's Arabesque imprint, Harlequin's Kimani Romance imprint, Evernight Publishing, and recently signed with Boroughs Publishing. She is now digitally publishing under her company Stella Maris. Thank you for the feature. I love this story.